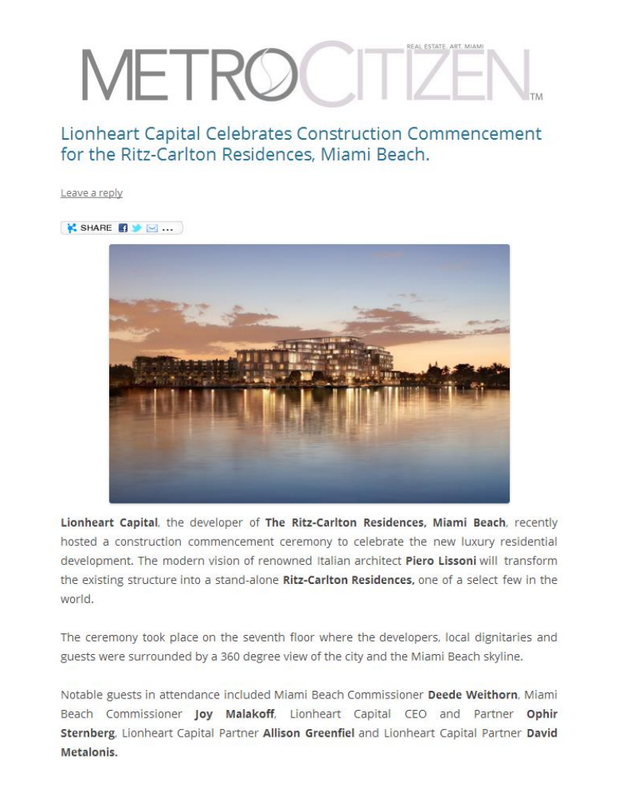 LIONHEART CAPITAL CELEBRATES CONSTRUCTION COMMENCEMENT FOR THE RITZ-CARLTON RESIDENCES, MIAMI BEACH. Lionheart Capital, the developer of The Ritz-Carlton Residences, Miami Beach, recently hosted a construction commencement ceremony to celebrate the new luxury residential development. The modern vision of renowned Italian architect Piero Lissoni will transform the existing structure into a stand-alone Ritz-Carlton Residences, one of a select few in the world.The ceremony took place on the seventh floor where the developers, local dignitaries and guests were surrounded by a 360 degree view of the city and the Miami Beach skyline. Notable guests in attendance included Miami Beach Commissioner Deede Weithorn, Miami Beach Commissioner Joy Malakoff, Lionheart Capital CEO and Partner Ophir Sternberg, Lionheart Capital Partner Allison Greenfiel and Lionheart Capital Partner David Metalonis. After the ceremony guests enjoyed a light brunch and mimosas, while they toured the contemporary-designed sales gallery, which features a high-tech media wall, including holograms, an interactive presentation, and dioramas of the project as well as a screening room which features a short film about The Residences. The event concluded with guests on the Sales Gallery’s outdoor patio overlooking Surprise Lake, which showcased the project’s 2014 VanDutch 40 on a private dock. There will be 36 boat slips available for purchase at The Ritz-Carlton Residences, Miami Beach, offering appeal to boaters.